BASILYSK is a Death Metal band from Philadelphia, Pennsylvania that has been around since 2009. So far the band has several demos to their credit along with an EP that was released in 2012, "Seasons Of Misanthropy". 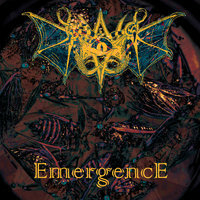 "Emergence" is their first full-length album. The opening track also happens to be the title track, "Emergence". It's an odd instrumental piece which gave me the impression that I was actually listening to some sort of experimental music rather that straight Death Metal. While it's interesting to say the least, I am not sure it was the best choice to start the album with. "Molestor Of Dreams" has a much more traditional Death Metal sound to it with its' fast pace, heavy percussion and bass-line along with some nice twin guitar attacks. There are also a couple of great guitar solos featured in the song as well as a surprise bass solo. The guttural vocals of Josh Perrin round out the song quite well, making it a good one. "Sinners In Their Own Reality" has some great Speed Metal overtones to it. The beat is driving and extremely hard to resist thanks to the talented Michael Lee Churry. I noticed an underlying tension to the track that really added to the anger energy within it. Even after the song's pace changes slightly the overall sound remains quite good. It's the sort of track that would draw any rebellious metal fan to it. "Sad State Of The The Arts" starts out FAST with even more aggression. I found myself very impressed by the technical expertise demonstrated by everyone in the band on this one. The entire track rolls along like a well-oiled machine. Simply brilliant! I also enjoyed track five, "Eyes". It's a pretty, mostly acoustic composition which is a nice way to break things up a bit. A very well-played piece with just the right touch of heaviness to it. "Fire (In The Temple Of Sacrifice)" is another super fast and heavy song that isn't quite as good as tracks 4 and 5. However, it is far from terrible so it is worth the time to listen to it. "Prebirth-Karma-Afterlife" is actually three songs in one. It tops out at over fourteen minutes, which I admit had me a bit worried at first. It's been my experience that super long tracks either tend to be excellent or awful with very few variations in between. Fortunately, this song is EXCELLENT. It has a somewhat Middle Eastern-sounding intro which is very nice with its' melodic guitar riffs. As the song progresses into the middle it becomes louder and a little faster with plenty of excellent twin guitar attacks to keep it interesting. With an outstanding arrangement, great tempo and good pace the track will have you head-banging as you listen to it. Once the last part of the song starts it becomes an instrumental track that is centered around the guitars themselves. Yes, it is a long song yet it didn't seem that way while I listened to it. Unfortunately, after track seven the album goes downhill significantly. Tracks 8 through 13 are literally NOTHING, just dead silence. I wasn't amused by that, nor did I appreciate the plain noise on tracks 14 and 15. I am still confused why an obviously talented band would pull a move that is rather foolish. The confusion increased after discovering that the final track, "Clouds," is the best instrumental on the entire album. Why would anyone risk this song being overlooked by putting it after a bunch of garbage? Hopefully the fans of BASILYSK are patient enough to find it. If not, the band has themselves to blame, no one else. I'll put my annoyance about tracks 8 through 15 aside because I really did enjoy the rest of the album. Add it to your collection, too; you won't be sorry, especially if you just skip those tracks I mentioned and go directly to the last song.